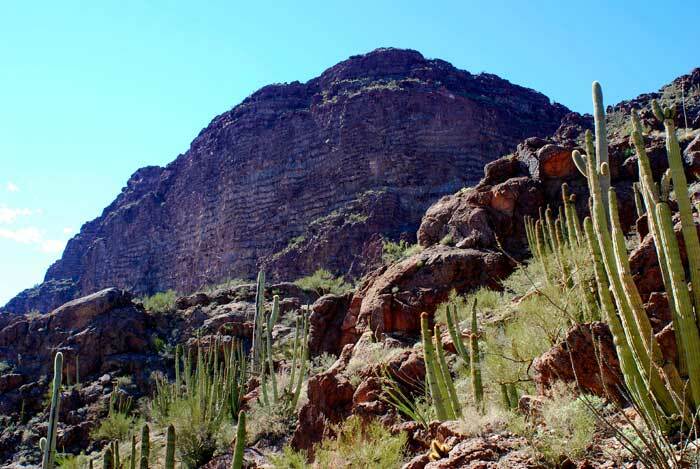 Kino was suspended from the DPS list a few years back due to a Border Patrol request to not hike in the area around Kino. From talking to a ranger at the Visitor Center last year, the request to not hike near Kino was really more of a hike it at your own risk kind of message. A large number of illegal immigrants have been passing through the Kino range on their way north as a result of greater enforcement at the California border. We decided to climb Kino anyway, since we were in the area to climb Cerro Pinacate, and because Kino is quite an impressive-looking peak in the region. From the town of Ajo where we were staying, the DPS driving instructions got us to the approximate start of Route B (waypoint KINOTH), which is 2 miles west of the start for Route A at Bates Well (waypoint BATESW). We had a flat tire of our way to the trailhead. But with 4 motivated people wanting to hike, we got the tire changed in 20 minutes. It was going to be a hot day for late February. The temps were forecasted to reach the high 80s, or even 90 degrees, which was going to be a record-breaker for this day in some areas of southern Arizona. We all started with about 3 quarts of water, but this turned out to leave us a little on the dry side by the end of the day. Within the first few hundred feet, the brush became a little thick around a wash, but then the terrain opened up nicely south of the wash (waypoint KINRB1) with a great view of Kino and the wide mouth of the canyon where the route led. We hit some thicker vegetation crossing Growler Wash after a little over a mile of walking, but travel was easy again after leaving the wash. Keeping Kino Peak on the right, we entered the wide canyon (waypoint KINRB4) and continued our gradual ascent over easy desert terrain. Steve had entered waypoints for the peak and other prominent points in his GPS, so we had no trouble finding the correct canyon. Don't bother looking for use trails or ducks. Route B appears to see little activity as a climbing route for Kino. After a total of 3 to 3.5 miles of walking the canyon began to narrow considerably, the vegetation became thicker, and the terrain became steeper and rockier. We spied a very small keyhole on a ridgeline above, which was noted in the Guidebook. The keyhole is a landmark to help climbers avoid wandering into the wrong left fork where the canyon splits. We continued into the correct, right fork here, but it was not difficult to go wrong because we knew the summit of Kino was still to our right behind cliffs. We next bushwhacked our way to what turned out to be the crux of the climb. A huge chockstone in the narrow canyon blocked our progress (waypoint KINRB7). We began to wonder if we were on the correct route because there was no mention of the chockstone in the Guidebook. After a little searching, a difficult move directly to the left of the chockstone got most of us around this impediment. But Steve then found an easier way that went through a little hole under the left side of the chockstone. Our worries about being in the wrong canyon were allayed once over the chockstone because we could now see the obvious U notch, mentioned in the DPS Guidebook, just under Kino Peak. The rocky terrain and heavy brush eased off after the chockstone, and we were able to reach the U notch (waypoint KINSAD) with little trouble. At the notch, we climbed up and across the NE face of the massive summit block of Kino, following occasional ducks and ledges. After almost reaching the northern terminus of this massive summit block, we were able to climb up onto the top of the ridgeline through a break in the cliff face (waypoint KINTRW) and head back south to the high point of Kino. As class 3 climbs go, Kino was a moderately easy class 3. Photo 1: On the summit ridge: John and Larry nearing the high point of Kino in the center of the photo. Just before reaching the summit, we disturbed over a dozen bighorn sheep grazing just below the rocky outcropping that is the high point of Kino Peak. They all ran off in a couple different directions, the last to leave were a ewe and her young lamb. Really cute! On the summit, although there were numerous entries in the register up to 2005, only 3 small groups had signed in since then: two parties in 2006 and one party in 2008. Border Patrol discouragement and DPS suspension really put a damper on visitation. After a 30 minute stay, we headed back down to the U notch with our minds mostly made up to take Route A back to the trailhead. The excessive bushwhacking in a few spots on Route B led us to think Route A might be better. Steve had a detailed map of Route A, which helped us make our decision to go for Route A. From the U notch, we traversed NE around the corner staying at roughly the same elevation as the notch because there was a significant cliff band below us. Photo 2: The amazingly striated east face of Kino Peak from Route A. Following occasional ducks and a vague use trail, this route led us eventually to a spot where the cliffs below ended and we could begin descending (waypoint KINTRE). We mostly stayed on or near the ridge detailed in the DPS Guidebook for Route A heading for a low spot, or saddle, in the Kino range where a better use trail is said to be. With a few hundred feet left to descend to the saddle, we left the ridge dropping straight down into the small canyon to the north. A little downclimbing on class 3 rock near the saddle (waypoint KINRA6) made the route a little more interesting. Just north of the saddle, we found a well-used trail and were a little dumbfounded, at first, why such a good trail existed here in the proverbial middle-of-nowhere. Hiking north on the trail, we then started seeing a myriad of cast off water bottles and food cans alongside the trail. It then became clear this was a favored route through the Kino range for illegal immigrants. The trail dropped into a wash after about a mile and then followed the wash north. We passed some favorite Palo Verde trees used for shade that had large piles of trash beneath them. We decided to exit the wash after awhile (waypoint KINRA4), perhaps to avoid a possible encounter with illegals hiding there, and began following one a several poorly defined trails NW towards some red bumps in a low point between some hills (waypoint KINRA2). This put us a direct line back to the beginning of Route B where Linda was waiting for us. We arrived back at the car a little later then expected; Linda had been waiting for us for over 2 hours. However, she had a rather eventful wait, as Border Patrol agents came by several times to see how she was doing. Of course, there was the suspicion that she was waiting for border-crossers. The agents were incredulous when she told them she was waiting for climbers to get back from Kino Peak. It wasn't that they didn't believe her, it was more like why would anyone be crazy enough to go climb a peak in the desert? Linda said the Border Patrol agents were all quite friendly and never suggested to her that she should not be there. She also had a visit by a National Park ranger to check if she paid an entry fee (Linda had a NP Golden Pass). Coincidently, the Border Patrol came by again just after we arrived back at the car. Or was it coincidence? We certainly thought it possible they had the technology to monitor our progress for much of our hike back from Kino. Anyway, the agent was a nice-enough fellow, and reported that they caught 14 illegals in the area earlier that day, some of which were carrying drugs. To conclude, no one will stop you if you really want to climb Kino Peak. If you must leave a vehicle at the trailhead, I would suggest leaving a note on your windshield for the Border Patrol and Park Rangers if no one is staying with the vehicle while you climb. Route B is a little more challenging in terms of brush than Route A, but Route B has the lesser chance of run-ins with border-crossers than Route A. Also, Route A is partially ducked and has a use trail some of the way. It's only you and the map for Route B. The round-trip hike was about 11 miles, and took us 8 hours and 20 minutes. Detailed maps with labeled waypoints for our Route B to Route A loop trip are below. 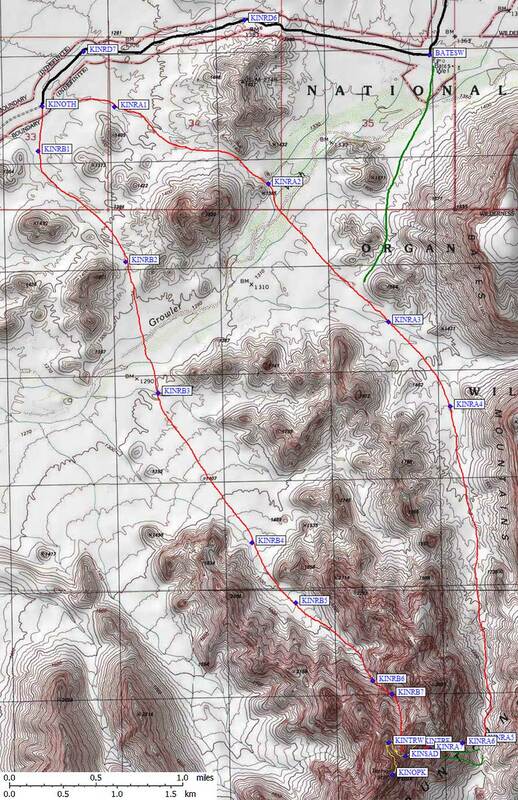 Waypoints for the drive AND climb are available on the Kino trailhead page. 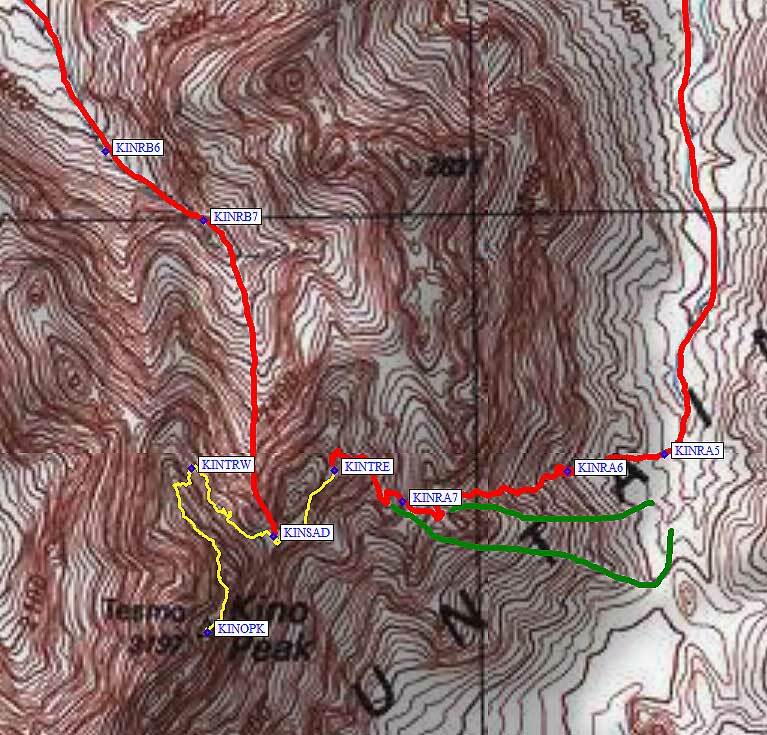 The yellow line is the hard-to-find traverse, the red line is our route, green lines are alternate routes we did not use.